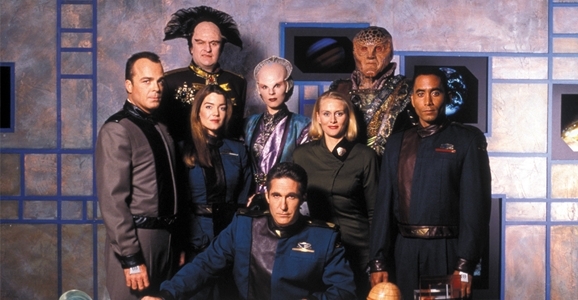 One of the things that drives us nuts here at GFR is how Warner Bros. is allowing Babylon 5 to languish in obscurity. It’s one of the best science fiction shows in history, but with every passing year, it seems there are fewer and fewer people who have even heard of it, much less seen it. That’s hugely frustrating simply because Warner Bros. could help rectify that simply by making a deal to put it on one of the major streaming services like Netflix or Amazon. Sure, the devout already own it on DVD, and you can purchase digital copies, but neither of those options makes it easy for new fans to discover the show. That sort of easy availability has helped ensure that shows like Farscape and Firefly still enjoy a vibrant and growing fan base…but Babylon 5, not so much. The #FreeBabylon5 panel will examine ways the fans are trying to get J. Michael Straczynski’s sci-fi classic back in the spotlight. Aside from, you know, THE OBVIOUS ONES I ALREADY MENTIONED. Richard Hatch (Tom Zarek, Captain Apollo), Jamie Bamber (Lee Adama), and science consultant Dr. Kevin Grazier will host a discussion of the past and future of Battlestar Galactica, including the movie that’s in the works. The panel will include a preview of the new Transformers animated series, Robots in Disguise, which is set to premiere on the Hub Network in 2015. Also a look at the third season of Transformers: Rescue Bots, which my kids love, so if they sneak into the panel somebody give me a shout, okay? The only question I would have for the Under the Dome panel is, “Why is your show so terrible?” But if you’re a fan, this panel will feature a sneak preview of upcoming episodes and a panel discussion including cast members Mike Vogel, Dean Norris, Rachelle Lefevre, Alexander Koch, Colin Ford, and Mackenzie Lintz, along with executive producer Neal Baer.